Tue, Jan 22, 2019, 10:45 pm SL Time, ColomboPage News Desk, Sri Lanka. 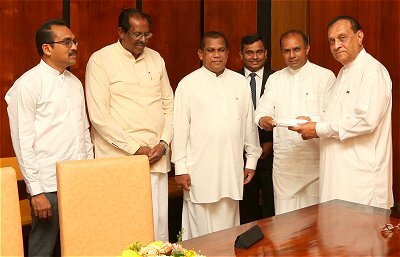 Jan 22, Colombo: The report of the Committee appointed to probe the unruly incidents in parliament on November 14, 15 and 18 has been handed over to the Speaker of Parliament Karu Jayasuriya today (22). Accordingly, the committee appointed by the Speaker appointed to conduct a broad internal investigation into the disorderly conduct in parliament during last year's political crisis had submitted the report to the Speaker at 12.20 p.m. this afternoon. The committee chaired by the Deputy Speaker MP Ananda Kumarasiri comprises former Speaker MP Chamal Rajapaksa, MPS Ranjith Madduma Bandara, Chandrasiri Gajadheera, Bimal Ratnayake, and Mavai Senathirajah. The committee members had reviewed the CCTV footage available on the relevant parliamentary dates in separate pairs. They had then studied the CCTV footage together at several occasions to compile the report. The speaker will refer the report to the Attorney General and the speaker will inquire from the Attorney-General on whether legal action can be taken against the parliamentary members involved in the incidents. It is reported that after the Attorney General informs the Speaker of the actions that can be taken against the unruly MPs, the report will be presented to the parliament and the proposed measures will be approved. During the parliamentary session held on November 15 and 16, the unrest in the floor of the House had caused damages to the properties of the Chamber.